The fate of the building that formerly housed the Arizona Challenger Space Center, 21170 N. 83rd Ave., adjacent to Sunrise Mountain High School, has been delayed, shifted gears and remains up in the air. The facility had been intended to house Peoria Unified’s Medical, Engineering, Technology students, but now the district is looking at other options including a possible art center concept and an arts Advanced Placement center. The governing board could consider the fate of the building at a public meeting this spring, but no exact date has been set. Compounding delays was a governing board-ordered internal investigation to uncover why governing board members were not alerted to skyrocketing expenses of nearly $1.5 million to make the building student-ready. Superintendent Linda Palles Thompson said an investigation has been completed. She said at the time of the Challenger purchase, August 2017, there was a plan without clear parameters and a rushed timeline that had little chance of being successful in converting a space designed as a interactive museum into an educational facility suitable for student instruction. Additionally, staff has more clarity now that a $189.2 million bond posed to voters has been decided, failing by about 6 percent in the Nov. 6 general election. Officials said the earliest move-in date would be the 2019-20 school year, depending on the final determination of programing. “Now that the bond is over, we can receive more direction,” said John Croteau, chief operations safety and risk management officer. The bond would have funded new infrastructure for two schools, but will now force officials to look at new ways to deal with overcrowding schools in the growing northern part of the city. Mr. Croteau said the former Challenger building is one way to meet those enrollment needs with neighboring Sunrise Mountain, 21200 N. 83rd Ave., at capacity. But first the Challenger building must be up to code, he said. It will take $507,000 to get it ready as an educational setting. Updates include improvements such as a new restroom, fire alarm and energy management systems, plumbing, electrical, walls, painting and flooring, as well as IT networks and devices. Mr. Croteau said that in utilizing the facility, the district hopes to increase enrollment capacity in the northern part of the district, optimize the unique footprint of Challenger center to maximize use of space and enhance future program opportunities for students and the community. Moving forward, the staff and governing board are looking at creative ways to use the building, but Mr. Croteau said transforming a building that was set up as a museum to look like a spaceship into an educational space poses challenges. The district is considering moving the four visual arts classrooms, which are bigger than normal classrooms, from Sunrise Mountain into the Challenger building,which could become an art center and district-wide Advanced Placement program. Director of Art Education Robert Panzer said the rooms at the high school could be converted to create up to seven general education classrooms that could house up to 35 students per classroom. Mr. Panzer said with increased enrollment, the district has to look at the resources available, but getting creative, the building has some good benefits. Maybe the arts are a good thing for a unique space like this building, he suggested. 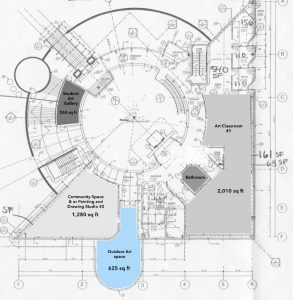 A proposed plan calls for the rotunda to be utilized as a flex space for small theater performances, as well as community rentals or a makerspace, a place where people with shared interests can gather, share ideas and create. Potential uses for the building include spaces for recording music or performances, arts education professional development, student art gallery and studio drawing. Mr. Panzer said some spaces are very appropriate for musical rehearsals, such as choir or jazz band. Mr. Panzer said the facility could be used for community education programing in the evenings with the possibility for a partnership with the city of Peoria and the community for rental space as a revenue generator. District officials would not speak about how much the art center concept might cost. PUSD CFO Michelle Myers said before costs can be considered, architectural designs must be completed, which would cost $35,000 to 40,000. A possibility still on the table is selling the district administrative building, 6330 W. Thunderbird Road, Glendale, and moving staff into the Challenger building. President Monica Ceja Martinez said she needs to know the financials, not only for the proposed art center, but also other options, including possible revenue gained from selling the administrative building. Governing boardmember Beverly Pingerelli said the art center concept is a great idea but also wanted to consider all options.